If you are fond of cooking but short of money then the perfect business you can start is catering. It will cost far less than setting up a hotel and restaurant but provides immense profit. It doesn’t take much money and you can use your expertise for profit that can be turned in to a stable business in future. UAE is a hub for both big and small businesses and you can get superb opportunities for setting up catering business in the country. You can start your business in both mainland and specified free zones available in UAE. 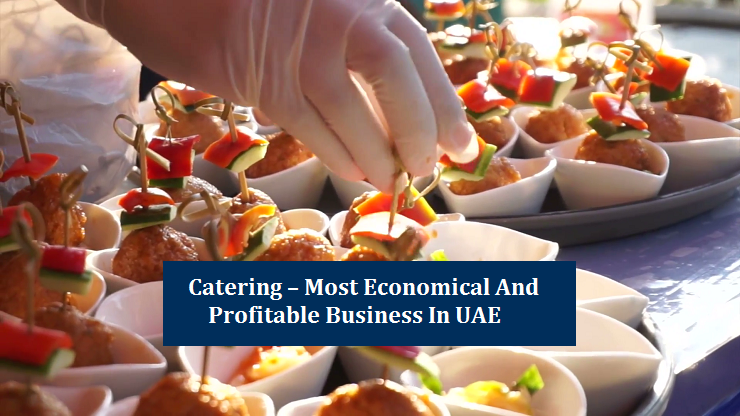 You can serve from 5 to 50 or even more people per day with your catering business and such opportunities are widely available in UAE.Following are the reasons that make catering a profitable business in UAE. UAE is a place of working people (businessmen and job seekers) from all around the world. Most of these people have 9 am to 5 pm working hours’ job during which they would like to eat from any small restaurant or hotel. But there is also awareness about health among these people and they want to eat fresh and healthy food from home-based kitchen. You can easily contact such people after establishment of your catering business and can easily earn handsome income by booking food for just few people. Expats form around 85% of UAE population and most of these expats live without families that create the requirement of outside food for these expats. Apart from hoteling, the catering business can also thrive in this situation. There are large numbers of visitors and tourists in UAE that gave rise for development of hotel business as these people live prefer to live in these hotels. But not all these hotels prepare food for their customers. The catering business can also flourish by using these hotels as they (hotels) can use catering service to provide healthy and fresh food for their customers. UAE is famous for big wedding ceremonies and other events. People are served with lot of varieties in food in these wedding ceremonies and they are a sure way of progress of the catering business. The points given above shows that several types of opportunities for catering business are available in UAE through which serving from few clients to family parties and large wedding ceremonies are possible. But in the beginning, you should start on small scale because it will be difficult for you to manage deadlines. You can start with small birthday parties in your vicinity and then start to provide catering to large wedding parties after getting some experience. Kitchen is a necessary place for your catering business as you will prepare the most important food there. But you can choose between home, commercial or full time kitchen for this purpose. In the start, you will only need a small kitchen and this requirement can be fulfilled by a small home kitchen. But you will need a big kitchen after spreading of your catering business. In this case, a simple and cheaper option is commercial kitchen that can be rented for few hours or a day. But if your catering business is continuously booming then you will require a traditional renting of a large kitchen. A really important thing to consider in catering and any other business is the business plan by estimation of cost like rent, bills, equipment etc. and the rates of catering services according to the cast. This business plan will not only help you to charge suitable for your services that are economical for your customers and also fulfill your requirements. Cooking is the most important part of catering business but it is not the only important issue and marketing your business has almost the same importance as cooking food. You can market your business by using tactics like e-commerce (websites and blogs), business cards and brochures along with other traditional marketing methods. Providing quality service will also act as your marketing strategy as happy customers will refer your services to their friends and relatives that can easily help progress of your business. You can get license of catering business in UAE either in mainland UAE or in the free zones. You can get commercial license for setting up a business in mainland UAE through Department of Economic Development (DED), 51% of this business will be shared by a local Emirati sponsor. Due to this condition, many entrepreneurs choose free zone for setting up their business where they are complete owners of their business. But there are few limitations in free zones also e.g. your catering in free zone will remain in the area of free zone and taking your services in mainland will cost you pay tax. Apart from that, there are few free zones (like Jebel Ali Free Zone Authority or JAFZA) that categorize catering under service license in which you can only establish catering business as a branch of an already established company. You will also require a permit from the food control department only after which a food-stuff related business can be set up in UAE. To acquire this document, you will have to submit documents including employee health cards, trade license copies, letter of no objection, health & safety certifications and lab test reports. If you are hesitant to start catering business in UAE then feel free to contact us. Riz & Mona Consultancy provides free consultancy to its customers who want to start any business in UAE. You can contact us at WhataApp # +971 56 9971225.